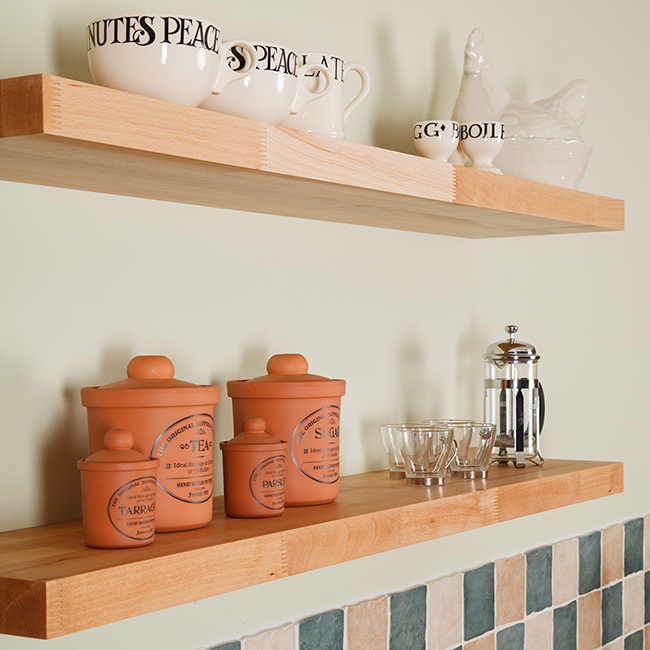 A hard-wearing and attractive timber, beech is an excellent choice for solid wood shelving. Our beech floating shelf is made from European timber of the highest quality, and — for your convenience — comes pre-drilled and ready to mount on the wall of your choice. Floating shelf fixings are also provided, to create the magnificent floating effect. Combining years of experience and a thorough knowledge of timber, our team of solid wood specialists have made this beech shelf with the utmost attention to detail. Once each shelf has been cut to size, it is sanded until impressively smooth and coated in nourishing wood oil. This floating solid beech shelf measures 1200mm X 200mm X 40mm and sports an attractive square edge profile. Constructed using the same techniques as our solid beech worktops, these shelves are made from 40mm-wide staves that are finger-jointed and glued under high pressure for maximum strength. This beech floating shelving is supplied with three brackets, which are disguised by the shelf once mounted. For maximum stability, we recommend fitting the brackets to a brick or stone wall. If you have stud partition walls, the brackets should be fixed directly onto the timber studs to ensure the weight of the wood is sufficiently supported. These shelves are made from real wood and therefore can display a range of characterful natural features, from the beautiful grain pattern to small knots and splits. These developments enhance the natural appeal of the shelves, and do no compromise its strength. is an attractive accessory for real wood kitchens.